Ricardo "Rickeh" Mulholland has had a roller coaster of a year. Having been a member of the Counter Logic Gaming roster that dissolved in late 2017, he spent months looking for a new team to play for before being picked up by Rogue late last month. Rickeh joined theScore esports Podcast to shed some light on the CLG situation, his competitive future with Rogue and more. Rickeh found himself in an unfortunate situation when CLG disbanded in November 2017 but has since found a new home when Rogue came knocking on his door last month. Prior to his time on CLG, Rickeh was a member of Renegades for eight months but eventually internal issues between himself and the team's coach, Aleksandar "kassad" Trifunović, resulted in him being benched. Eventually, with the help of the Renegades organization he was able to pursue other opportunities to play. "The organization in general was just a bunch of great guys and they understood the situation and they said, 'we're going to help you find another team and everything is going to be all sweet and sorted.' It was a blessing in disguise. It worked out best for both parties," Rickeh said of the end of his time on Renegades. 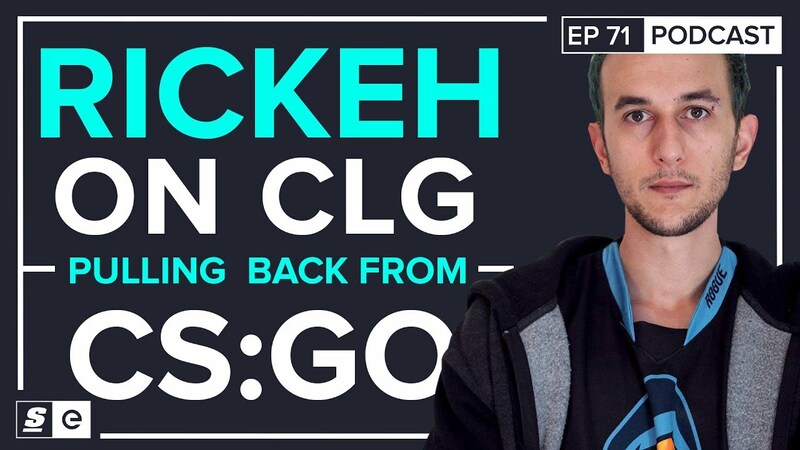 When speaking about his final days as a member of CLG, Rickeh said he has his suspicions about the org's ultimate decision to leave CS:GO being based at least partly on performance. "They didn't let us know until probably the last couple of weeks so I think it was results based. I think it depended if we qualified for the North American Minor to get to the Major qualifier. If we passed that, they probably would have considered keeping the team but there were some internal issues with not mainly me, but players and the organization in terms of salary, how much people think they're worth and things that CLG had promised players and then didn't receive. It's a business thing. Things happen, they understand, but at the end of the day they just came and said to us 'look, we did say that we're going to keep you guys' but when Madison Square Garden came into the picture they decided to clean up the organization and put business first which I completely understand. It didn't put us in the best situation but, that being said, I had a four month paid break in Australia as well so I had time to chill, relax, go back home, gather everything and decide what I want to do again, if I want to come back or not." It was during this break that Rickeh made the decision to travel back to North America and try to secure a spot on a team there. "I know for a fact, not only that it's more profitable in Europe and North America, but that at the same time you have a better opportunity with a team that has a chance to be more successful in these regions. Not only do you get to play more competitions and there's more chances but there's also better players. It was a bit of both for me. Obviously there's more money but at the same time all of the players are better and have more experience." After getting a taste of the NA experience over the past year and a half, Rickeh packed up and moved to North America, planning to grind FPL until he was able to find a team. "When Rogue approached me... these players as well, I see that they're just as good as Cloud9, OpTic and all the top teams in the North American region right now and we can definitely compete. I was more than happy to not only tryout with these guys and see how they play but they were happy to play with me." Prior to signing with Rogue, Rickeh said he was negotiating with at least two other tier one organizations in North America but nothing was ever finalized. When Rogue eventually put an offer in, he said he knew the team was the right fit for him. "The players have more than enough skill to progress in the rankings and together I think we can make top 10 or possibly even more. So there was that side as well but then I did my research on Rogue as an organization and what they do for their players and all the stuff that they have behind them. Steve Aoki obviously plays a big part in the team, their streamers like DrLupo and all those cool guys. So I looked at the organization as well and said 'these guys are good.'" Rickeh said the experience with CLG helped him better understand the business side of Counter-Strike. "I realized very quickly just how volatile the environment is and I thought to myself that it's very much results based. It does sound selfish in a way but you do have to focus on yourself individually because... you can play for a team where whether they do good or bad is the basis of whether your org will have you or not. There's always the aspect of 'I'm scared to lose the organization, I'm scared to lose my job,' but at the same time if you focus on your own individual performance and play well within the team and do your job then there's always sort of a safety net... it's always good to take care of yourself." Rickeh did not mince words when it came to the expectations he has for this new Rogue roster. "I would like to, minimum, get us into the top 10. Whether that means winning tournaments, I think it's more important to make playoffs, make semis and always get into deep runs because you don't have to win a tournament to break into the top 15 or top 20. As long as you're consistently making semis or making playoffs, you'll always get into that sort of spot... As soon as you get used to that sort of thing then eventually you're going to win a title. It's just a matter of time for us. Consistency is key."